A biodegradable and environmentally safe hard surface disinfectant and cleaner naturally derived from organic acids and surfactants. It will kill 99.9% of bacteria & microorganisms. A biodegradable and environmentally safe hard surface disinfectant and cleaner naturally derived from organic acids and surfactants. It will kill 99.9% of bacteria & microorganisms to EN1276 & EN13697 standard and thus is an excellent and sensible alternative to traditional disinfectants. It is suitable for cleaning all galleys, washrooms and cabins etc. leaving a perfume fragrance. 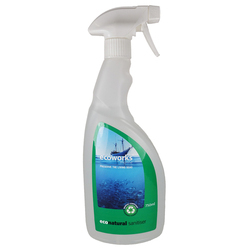 This boat cleaner is compliant to MARPOL Annex 5 1.7.5 and is declared not harmful to the marine environment. The spray bottle applicator has an easy to use trigger and three function nozzle, off/spray/jet for application direct to surface. Developed with plant derived, carbon neautral, eco-solvent which effectively replaces conventional solvents whilst still providing excellent cleaning abilities and lasting shine. Readily biodegradable and enivronmentally safe formula using naturally derived organic acids. Compliant to MARPOL Annex 5 1.7.5 and is declared not harmful to the marine environment (set out by the The Marine Environment Protection Committee). Three function nozzle, off/spray/jet, for application direct to surface and is ready to use. Contains and mild lemon & lime fragrance. Ready to use with no dilution required. Safe to use on hard surfaces including worktops, GRP, wood, laminates, hard plastics and painted surfaces.